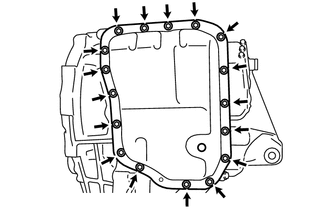 (a) Check each bearing position and installation direction. 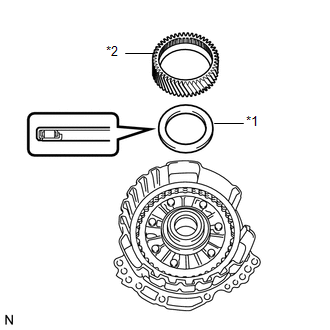 Perform this procedure only when replacement of the counter drive gear bearing or transaxle case sub-assembly is necessary. 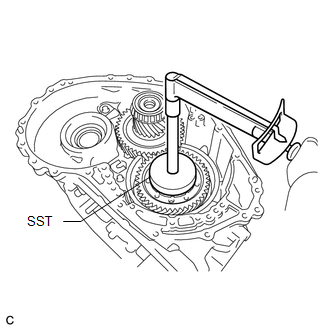 (a) Using SST and a press, install a new counter drive gear bearing (outer race) and snap ring to the transaxle case sub-assembly. (a) Using SST and a hammer, install a new counter driven gear rear tapered roller bearing outer race to the transaxle case sub-assembly. 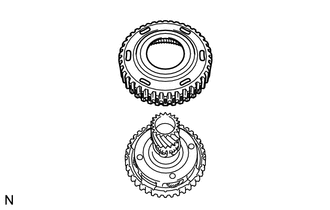 Make sure to install the counter driven gear rear tapered roller bearing outer race so that there is no clearance between the counter driven gear rear tapered roller bearing outer race and transaxle case sub-assembly. If there is any clearance, the turning torque of the counter driven gear cannot be measured correctly. (a) Install the shim to the transaxle housing. (b) Using SST, install a new counter driven gear front tapered roller bearing outer race to the transaxle housing. Make sure to install the counter driven gear front tapered roller bearing outer race so that there is no clearance between the counter driven gear front tapered roller bearing outer race, shim and transaxle housing. If there is any clearance, the turning torque of the counter driven gear cannot be measured correctly. 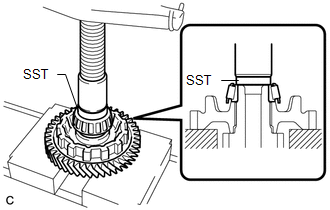 (a) Using SST and a press, install a new counter driven gear rear tapered roller bearing to the counter driven gear. Make sure to install the counter driven gear rear tapered roller bearing so that there is no clearance between the counter driven gear rear tapered roller bearing and counter driven gear. If there is any clearance, the turning torque of the counter driven gear cannot be measured correctly. 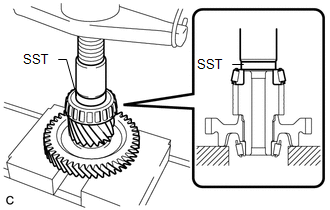 (a) Using SST and a press, install a new counter driven gear front tapered roller bearing to the counter driven gear. Make sure to install the counter driven gear front tapered roller bearing so that there is no clearance between the counter driven gear front tapered roller bearing and counter driven gear. If there is any clearance, the turning torque of the counter driven gear cannot be measured correctly. 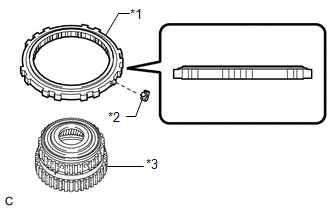 (a) Remove any remaining seal packing from the contact surfaces of the transaxle housing and transaxle case sub-assembly. 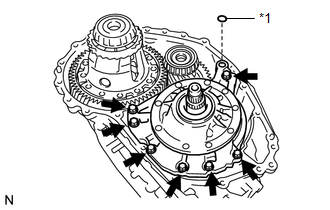 (b) Install the counter driven gear to the transaxle case sub-assembly. (c) Install the front differential case to the transaxle case sub-assembly. (d) Install the transaxle housing to the transaxle case sub-assembly with the 20 bolts. 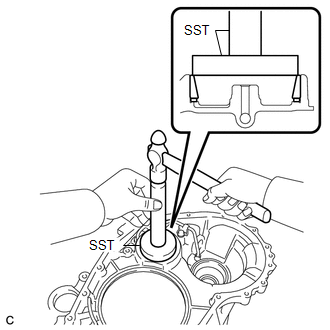 (e) Using SST and a torque wrench, measure the turning torque of the counter driven gear while rotating SST at 10 rpm. 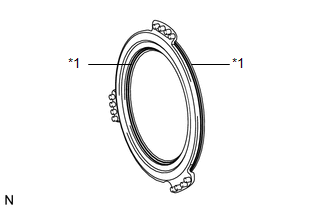 If the turning torque is not within the specified range, refer to the table below to select a shim for the counter driven gear front tapered roller bearing outer race so that the turning torque is within the specified range. (f) Remove the 20 bolts and transaxle housing. (g) Remove the front differential case from the transaxle case sub-assembly. 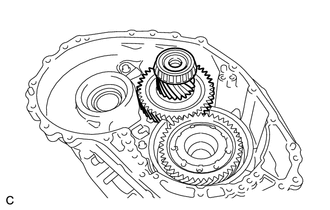 (h) Remove the counter driven gear from the transaxle case sub-assembly. (a) Coat the lip of a new manual valve lever shaft oil seal with MP grease. 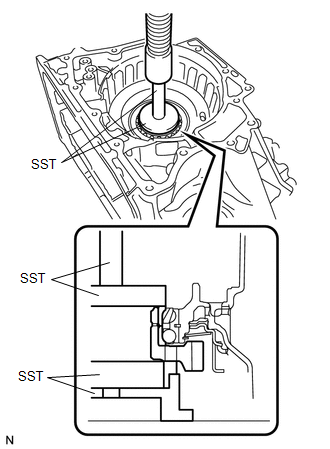 (b) Using SST and a hammer, install the manual valve lever shaft oil seal to the transaxle case sub-assembly. 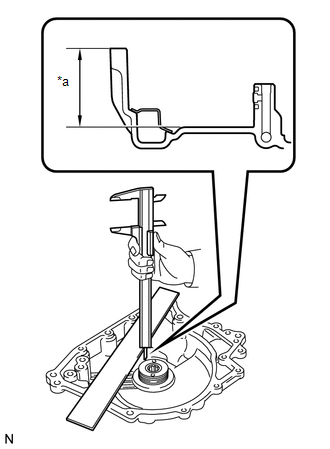 (a) Install the manual valve lever shaft sub-assembly to the transaxle case sub-assembly. 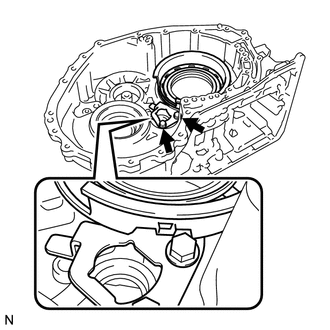 Do not damage the manual valve lever shaft oil seal while installing the manual valve lever shaft sub-assembly to the transaxle case sub-assembly. (b) Using needle-nose pliers, install the manual valve lever shaft retainer spring to the manual valve lever shaft sub-assembly. (a) Align the protrusions with the notches on the manual valve lever shaft sub-assembly and install the parking lock rod sub-assembly. 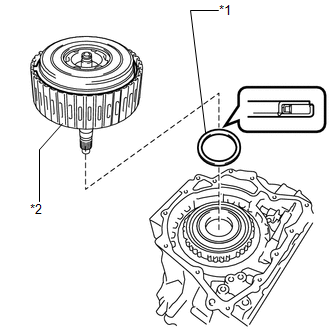 (a) Install the manual detent spring sub-assembly and cover to the transaxle case sub-assembly with the bolt. Make sure to install the manual detent spring sub-assembly first and then the cover. (a) Coat the contact surface of the transaxle case sub-assembly with ATF. (b) Coat the lip of the No. 3 brake piston with ATF. 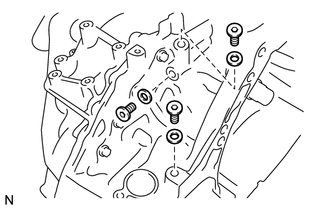 (c) Temporarily install the pawl stopper plate to the transaxle case sub-assembly with the 2 bolts. (d) Press the No. 3 brake piston to the transaxle case sub-assembly. Make sure that the lip of the No. 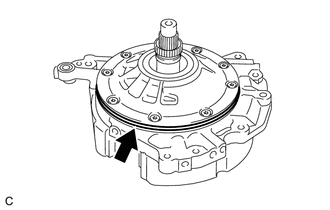 3 brake piston is not twisted and does not get caught in the transaxle case sub-assembly. After installation, make sure that the protrusions on the No. 3 brake piston and grooves on the pawl stopper plate are aligned. Use the installation surface of the brake piston return spring to press the No. 3 brake piston to the transaxle case sub-assembly. 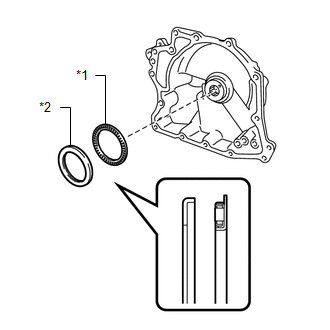 (e) Install the brake piston return spring to the transaxle case sub-assembly. (f) Remove the 2 bolts and pawl stopper plate from the transaxle case sub-assembly. 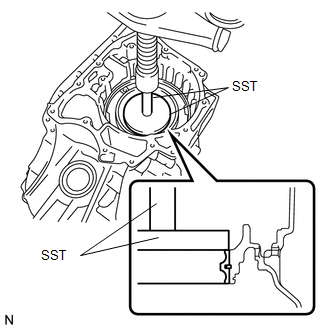 (g) Place SST on the brake piston return spring and compress the brake piston return spring using a press. Stop the press when the brake piston return spring is flush with the snap ring groove. 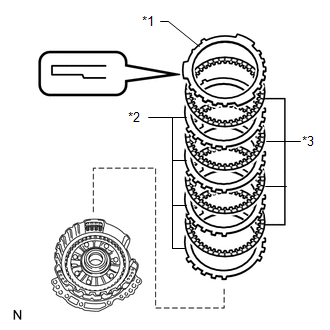 This prevents the brake piston return spring from being deformed. 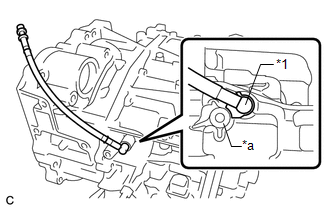 (h) Using a screwdriver, install the snap ring to the transaxle case sub-assembly as shown in the illustration. 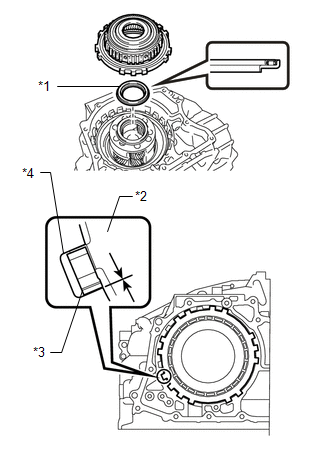 Confirm that the snap ring is correctly located in the groove of the transaxle case sub-assembly. 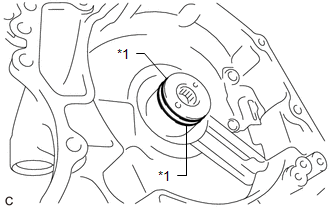 Be sure to orient the snap ring so that the edges do not protrude into a cutout on the brake piston return spring as shown in the illustration. (a) Install 2 new counter drive gear bearings (balls and cage) to the counter drive gear bearing (outer race). 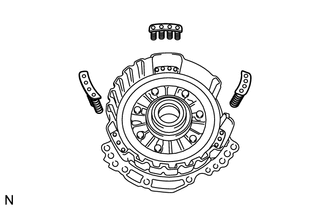 (b) Using SST, install the counter drive gear, a new bearing inner race (front side) and a new bearing inner race (rear side) to the transaxle case sub-assembly. There should not be any clearance between the bearing inner race (front side) and counter drive gear. 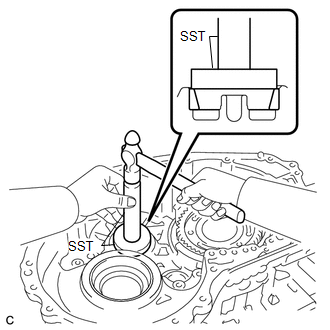 (a) Using SST and a press, install the front planetary gear assembly to the transaxle case sub-assembly. (a) Coat 2 new O-rings with ATF and install them to the No. 2 brake piston. Ensure that the O-rings are not twisted. (b) Install the No. 2 brake piston to the transaxle case sub-assembly. Be careful not to damage the O-rings. 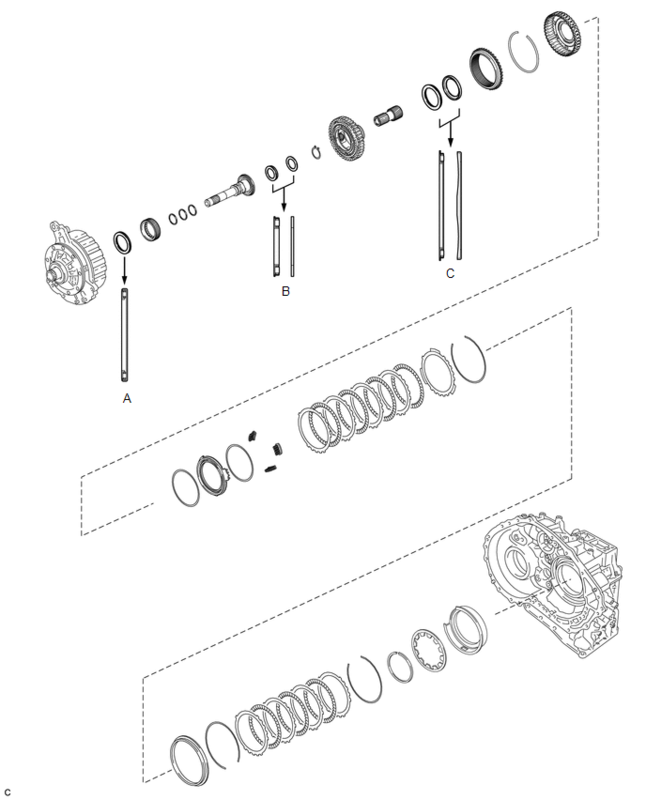 (a) Install the 1st and reverse brake return spring sub-assembly to the transaxle case sub-assembly. 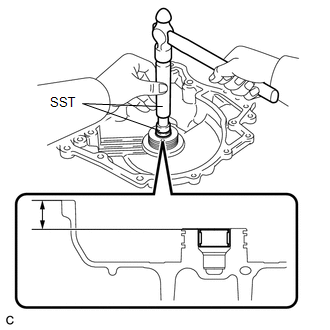 (b) Place SST on the 1st and reverse brake return spring sub-assembly and compress the 1st and reverse brake return spring sub-assembly using a press. 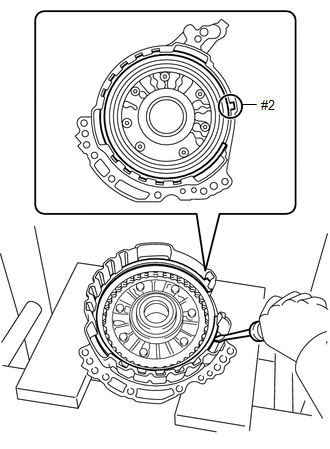 Stop the press when the 1st and reverse brake return spring sub-assembly is flush with the snap ring groove. This prevents the 1st and reverse brake return spring sub-assembly from being deformed. 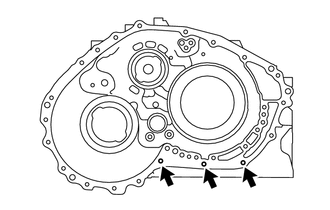 (c) Using a screwdriver, install the snap ring to the transaxle case sub-assembly as shown in the illustration. 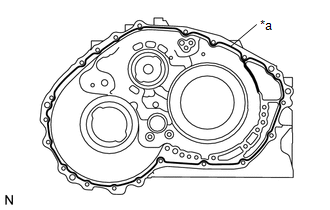 Be sure to orient the snap ring so that the edges do not protrude into one of the cutouts on the transaxle case sub-assembly as shown in the illustration. (a) Install the 5 No. 2 brake discs, 5 No. 2 brake plates and No. 2 brake flange to the transaxle case sub-assembly. Make sure that the No. 2 brake discs, No. 2 brake plates and No. 2 brake flange are installed in the correct order. 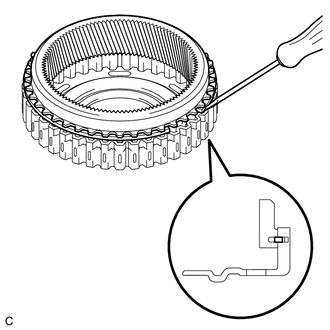 (b) Using a screwdriver, install the snap ring to the transaxle case sub-assembly. 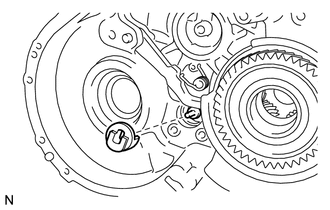 (a) Install the planetary ring gear flange to the planetary ring gear. 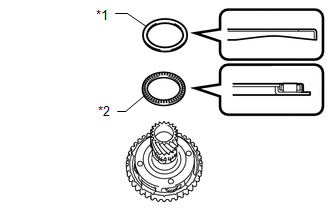 (b) Using a screwdriver, install the snap ring to the planetary ring gear. 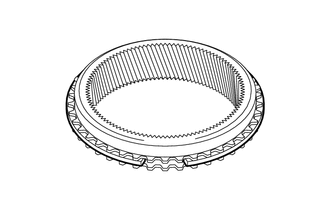 Confirm that the snap ring is correctly located in the groove of the planetary ring gear. 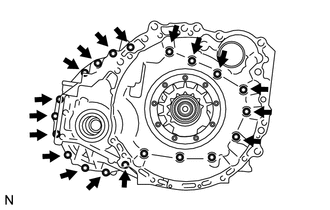 (a) Install the outer race retainer to the one-way clutch assembly. 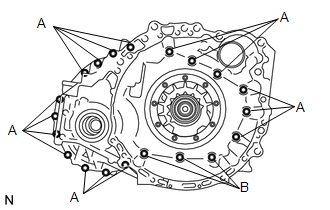 (b) Install the planetary ring gear to the one-way clutch assembly. 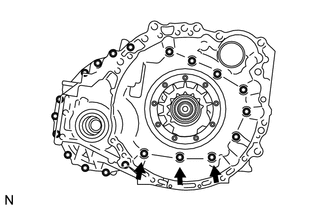 Make sure that the one-way clutch assembly is positioned in the correct direction as shown in the illustration. (a) Coat the thrust needle roller bearing with ATF and install it to the front planetary gear assembly. Be sure to install the thrust needle roller bearing so that the temper colored side of the race is visible. 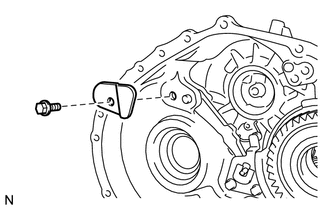 (b) Install the one-way clutch assembly with planetary ring gear to the transaxle case sub-assembly. 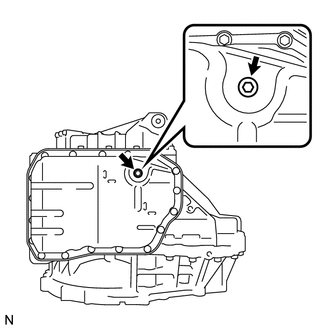 Make sure that there is no clearance between the outer race retainer and claw on the one-way clutch assembly. 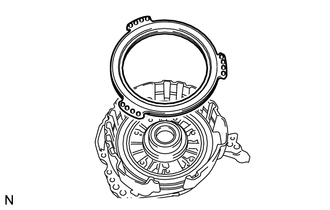 If there is any clearance, the spring of the retainer should be deformed. 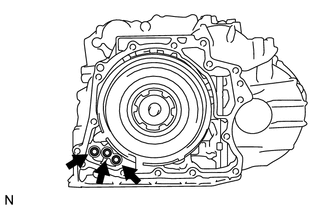 Make sure that there is no clearance between the one-way clutch assembly and transaxle case sub-assembly. 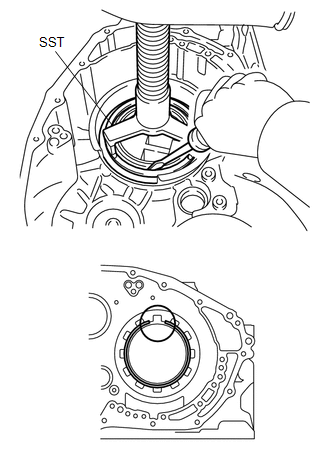 (c) Using a screwdriver, install the snap ring to the transaxle case sub-assembly. 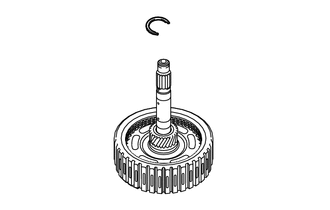 (a) Install the parking lock pawl to the transaxle case sub-assembly with the parking lock pawl shaft. 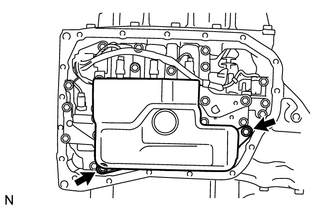 (b) Install the parking lock pawl pin to the transaxle case sub-assembly. (c) Install the spring to the parking lock pawl. 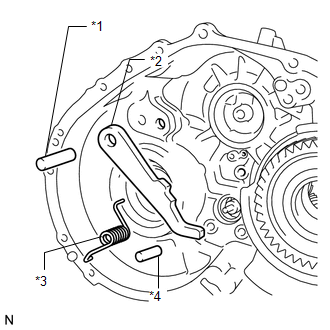 Make sure that one end of the spring is set in the hole of the transaxle case sub-assembly and other end is positioned on the parking lock pawl as shown in the illustration. (a) Install the parking lock sleeve to the transaxle case sub-assembly. 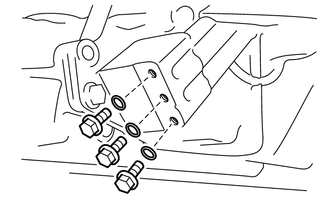 (a) Install the pawl stopper plate to the transaxle case sub-assembly with the 2 bolts. (a) Install the pawl shaft clamp to the transaxle case sub-assembly with the bolt. 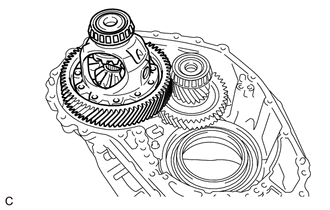 (a) Install the counter driven gear to the transaxle case sub-assembly. 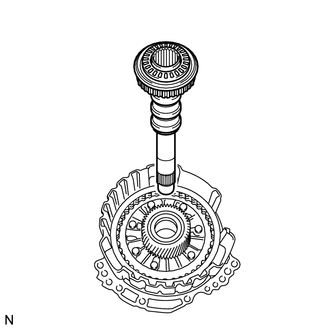 (a) Turn the manual valve lever shaft sub-assembly 2 notches counterclockwise to set it to the P position as shown in the illustration. 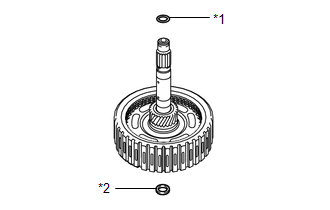 (b) Using SST, install a new counter drive gear nut. 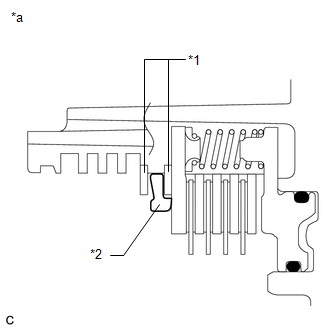 (c) Turn the manual valve lever shaft sub-assembly 2 notches clockwise to set it to the N position as shown in the illustration. 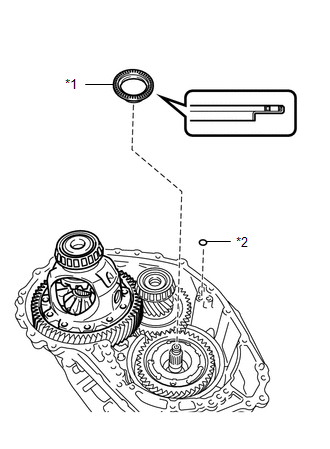 (d) Remove the counter driven gear from the transaxle case sub-assembly. 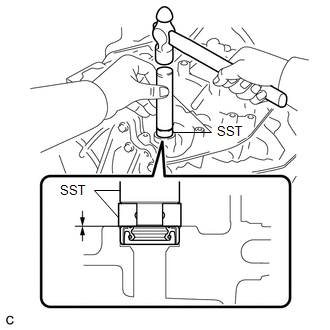 (e) Using SST and a torque wrench, measure the turning torque of the bearing while rotating SST at 60 rpm. 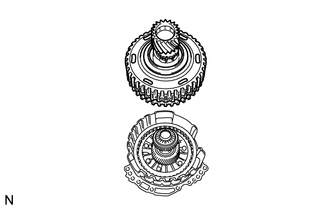 If the measured value is not within the specified range, gradually tighten the counter drive gear nut until the turning falls within the specified range. (f) Using SST and a hammer, stake the front planetary gear assembly. 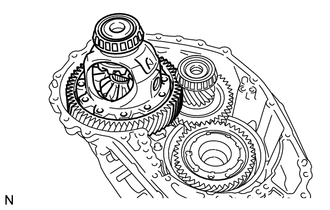 (g) Install the counter driven gear to the transaxle case sub-assembly. (a) Install the front differential case to the transaxle case sub-assembly. (a) Coat 2 new O-rings with ATF and install them to the No. 1 brake piston. (b) Install the No. 1 brake piston to the front oil pump assembly. 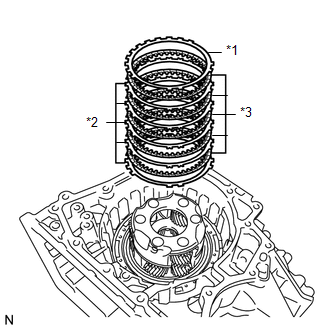 (a) Install the 3 2nd brake piston return spring sub-assemblies to the front oil pump assembly. Make sure that the 3 2nd brake piston return spring sub-assemblies are installed to the protrusions on the front oil pump assembly. (a) Install the 4 No. 1 brake discs, 4 No. 1 brake plates and No. 1 brake flange to the front oil pump assembly. Make sure that the No. 1 brake discs, No. 1 brake plates, and No. 1 brake flange are installed in the correct order. Be sure to install the No. 1 brake flange in the correct direction. (b) Place SST on the No. 1 brake flange and compress the No. 1 brake flange using a press. Stop the press when the 2nd brake piston return spring sub-assemblies is flush with the snap ring groove. 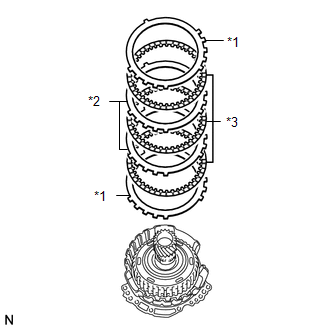 This prevents the 2nd brake piston return spring sub-assemblies from being deformed. 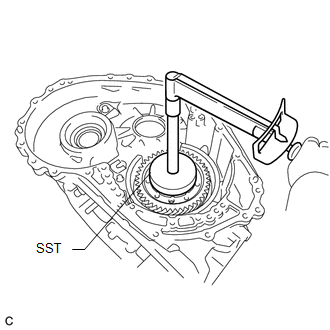 (c) Using a screwdriver, install the snap ring to the front oil pump assembly as shown in the illustration (#1). 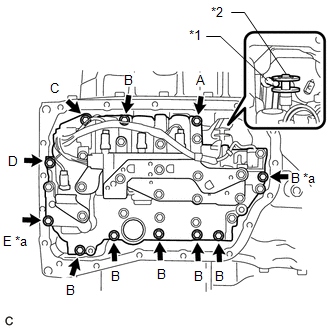 Confirm that the snap ring is correctly located in the groove of the front oil pump assembly. 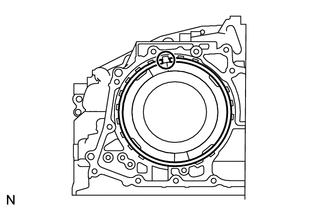 Make sure to align the protruding part of the snap ring with the cutout (#1) of the front oil pump assembly shown in the illustration to install the snap ring. 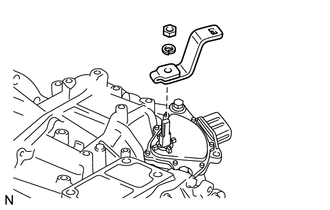 (d) Install the brake snap ring stopper to the front oil pump assembly. Be sure to install the brake snap ring stopper in the correct direction. 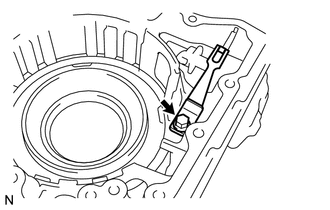 (e) Using a screwdriver, install the snap ring to the front oil pump assembly as shown in the illustration (#2). 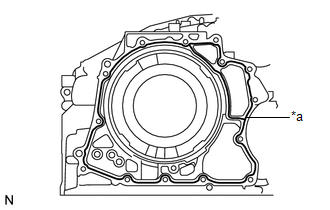 Make sure to align the protruding part of the snap ring with the cutout (#2) of the front oil pump assembly shown in the illustration to install the snap ring. (f) Check that the brake snap ring stopper can be turned by hand. 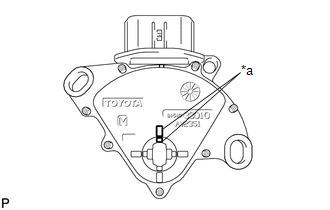 If the brake snap ring stopper cannot be turned by hand, the brake snap ring stopper may have been installed upside down, or a snap ring may not have been completely located in the groove on the front oil pump assembly. Remove and reinstall the snap ring and brake snap ring stopper. (a) Coat the thrust needle roller bearing with ATF and install it to the front oil pump assembly. 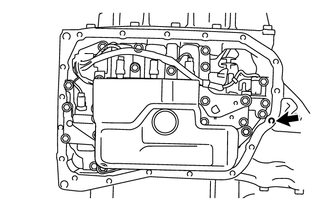 (b) Install the underdrive planetary sun gear to the front oil pump assembly. (a) Coat 3 new input shaft oil seal rings with ATF and install them to the input shaft sub-assembly. 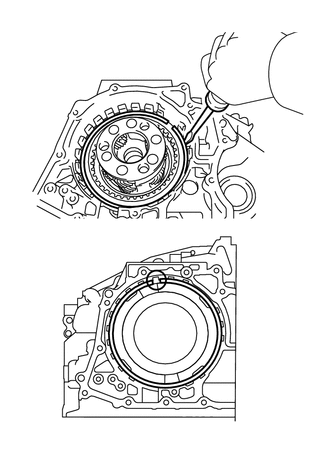 Do not expand the gap of the input shaft oil seal rings excessively. (b) Coat the thrust needle roller bearing and thrust needle roller race with ATF, and install them to the input shaft sub-assembly. Be sure to install the thrust needle roller bearing in the correct direction. 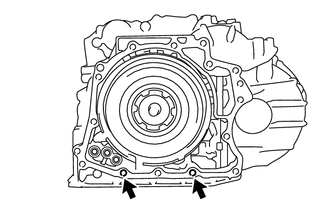 (c) Install the input shaft sub-assembly to the front oil pump assembly. 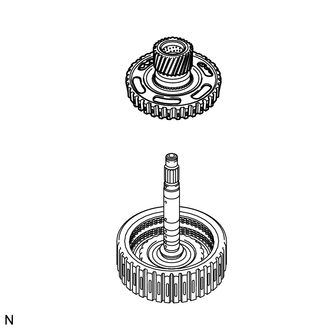 (a) Using a snap ring expander, install the snap ring to the underdrive planetary gear assembly. 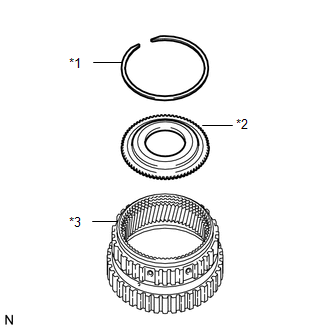 (b) Using a snap ring expander, install the planetary sun gear sub-assembly to the underdrive planetary gear assembly with the snap ring expanded. 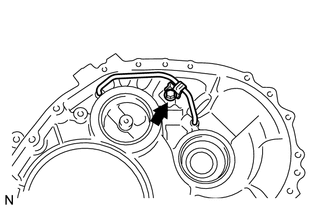 Perform this procedure only when replacement of the underdrive planetary ring gear or No. 3 brake hub is necessary. 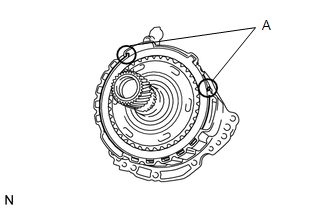 (a) Install the snap ring to the underdrive planetary ring gear. 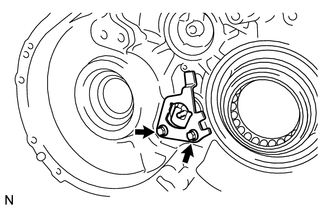 (b) While compressing the snap ring with a screwdriver, install the underdrive planetary ring gear to the No. 3 brake hub. Confirm that the snap ring is correctly located in the groove of the No. 3 brake hub. (a) Coat the thrust needle roller bearing and thrust needle roller race with ATF and install them to the underdrive planetary gear assembly. (b) Install the No. 3 brake hub to the underdrive planetary gear assembly. 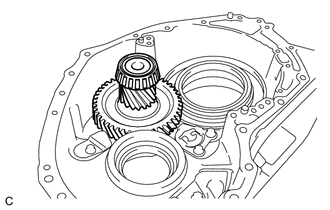 (a) Install the underdrive planetary gear assembly to the front oil pump assembly. (a) Install the 2 No. 3 brake flanges, 3 No. 3 brake discs and 2 No. 3 brake plates to the front oil pump assembly. Make sure that the No. 3 brake discs, No. 3 brake plates and No. 3 brake flanges are installed in the correct order. 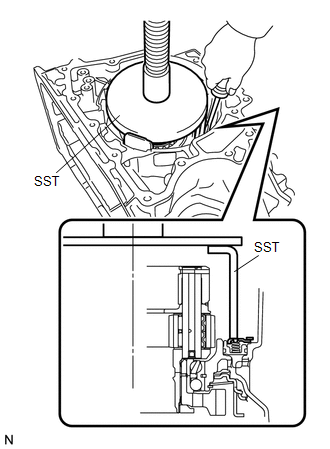 (b) Using a screwdriver, install the snap ring to the front oil pump assembly. 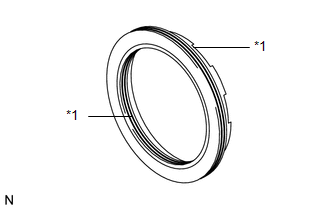 Make sure that the snap ring ends are positioned as shown in the illustration (A). 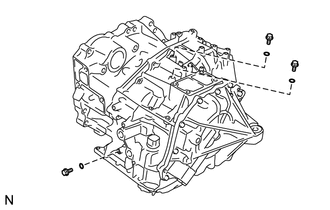 (a) Coat a new front oil pump body O-ring with ATF and install it to the front oil pump body assembly. 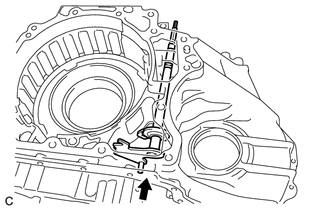 Make sure that the front oil pump body O-ring is installed correctly with the identification line facing outward and check that it is not twisted, protruding or damaged. (a) Coat a new O-ring with ATF and install it to the transaxle case sub-assembly. (b) Coat the thrust needle roller bearing with ATF. (c) Install the thrust needle roller bearing to the counter drive gear nut. (d) Coat the thrust needle roller race with MP grease. 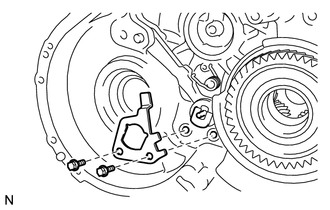 (e) Install the thrust needle roller race to the underdrive planetary gear assembly. (f) Coat a new gasket with ATF and install it to the front oil pump assembly. 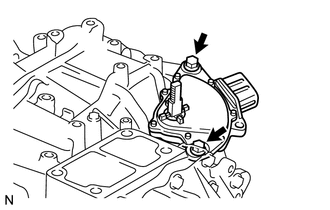 (g) Install the front oil pump assembly to the transaxle case sub-assembly with the 7 bolts. 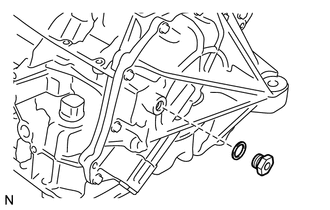 (a) Install the differential gear lube apply tube to the transaxle housing. 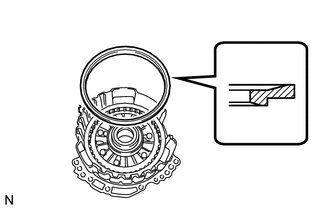 Insert the differential gear lube apply tube into the transaxle housing until it makes contact with the stopper. 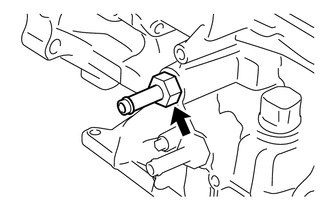 (b) Install the clamp to the differential gear lube apply tube with the bolt. There should be clearance between the differential gear lube apply tube and clamp. (a) Clean and degrease the 3 bolts and installation holes in the transaxle case sub-assembly. (b) Remove any remaining seal packing from the contact surfaces of the transaxle housing and transaxle case sub-assembly. Make sure that there is no ATF on the contact surfaces of the transaxle housing and transaxle case sub-assembly. 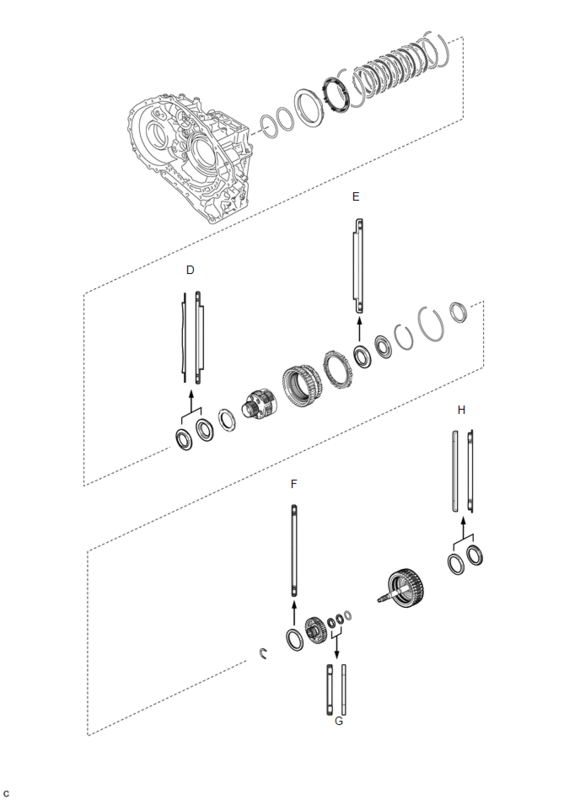 (c) Apply FIPG to the transaxle case sub-assembly. Apply FIPG in a continuous line (width 1.2 mm (0.0472 in.)) along the sealing surface of the transaxle case sub-assembly. (d) Install the transaxle housing to the transaxle case sub-assembly with the 17 bolts. (e) Apply adhesive to 2 or 3 threads on the ends of the 3 bolts. In order to ensure proper sealing of the 3 bolts, apply adhesive to the 3 bolts and install them within 10 minutes of adhesive application. (f) Install the 3 bolts. (a) Coat the thrust needle roller bearing and thrust needle roller race with ATF and install them to the direct multiple disc clutch assembly. 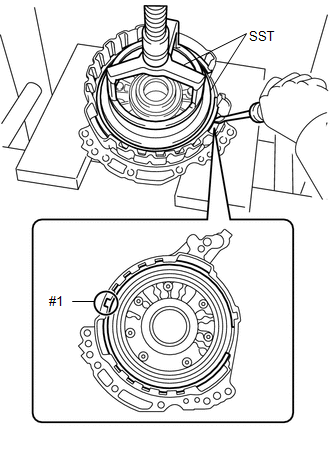 (b) Install the rear planetary sun gear assembly to the direct multiple disc clutch assembly. 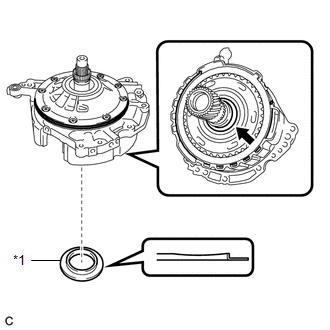 (c) Using a snap ring expander, install the snap ring to the direct multiple disc clutch assembly. 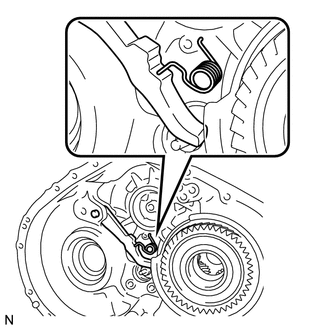 (a) Coat a new O-ring with ATF and install it to the direct multiple disc clutch assembly. 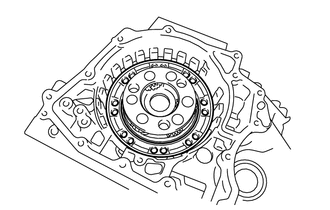 (b) Coat a new intermediate shaft oil seal with ATF and install it to the direct multiple disc clutch assembly. (c) Coat the thrust needle roller bearing with ATF and install it to the transaxle case sub-assembly. 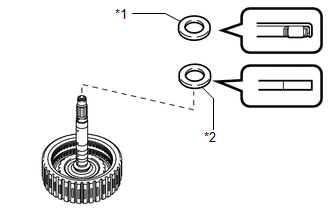 (d) Install the direct multiple disc clutch assembly to the transaxle case sub-assembly. 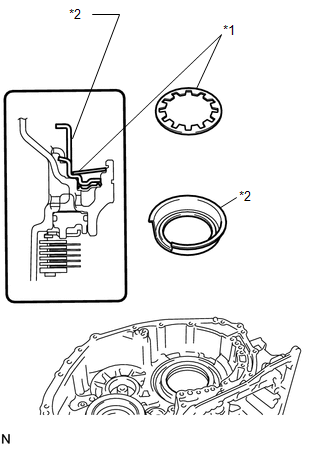 (e) Clean the contact surfaces of the transaxle case sub-assembly and rear transaxle cover sub-assembly. 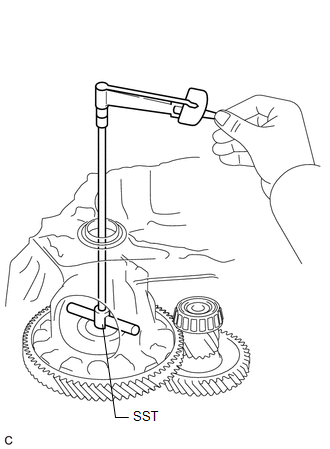 (f) Place a straightedge on the multiple direct clutch drum and measure the distance between the transaxle case sub-assembly and straightedge using a vernier caliper (Dimension A). (g) Using a vernier caliper and a straightedge, measure the distance shown in the illustration (Dimension B). 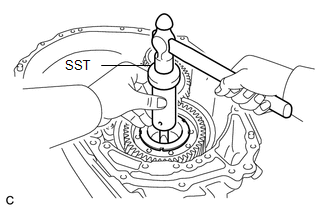 (a) Using SST and a hammer, install a new needle roller bearing to the rear transaxle cover sub-assembly. (b) Apply adhesive to the 2 "TORX" screws. In order to ensure proper installation of the 2 "TORX" screws, apply adhesive to the 2 "TORX" screws and install them within 10 minutes of adhesive application. 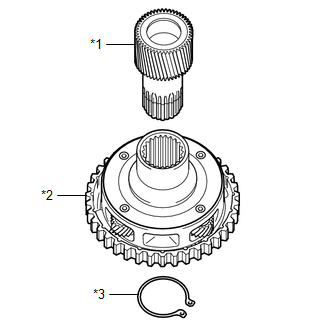 (c) Using a T30 "TORX" socket wrench, install the rear transaxle cover plate to the rear transaxle cover sub-assembly with the 2 "TORX" screws. (d) Coat 2 new oil seal rings with ATF and install them to the rear transaxle cover sub-assembly. 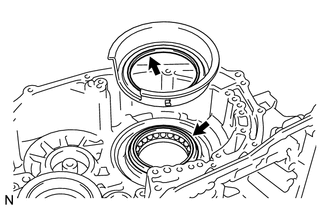 Confirm that the 2 oil seal rings are correctly located in the grooves of the rear transaxle cover sub-assembly. (e) Coat the thrust needle roller bearing and thrust needle roller race with MP grease and install them to the rear transaxle cover sub-assembly. (f) Coat 3 new O-rings with ATF and install them to the transaxle case sub-assembly. (g) Clean and degrease the 2 bolts and installation holes in the transaxle case sub-assembly. (h) Remove any remaining seal packing from the contact surfaces of the rear transaxle cover sub-assembly and transaxle case sub-assembly. Make sure that there is no ATF on the contact surfaces. (i) Apply FIPG to the transaxle case sub-assembly. (j) Install the rear transaxle cover sub-assembly to the transaxle case with the 12 bolts. (k) Apply adhesive to 2 or 3 threads on the ends of the 2 bolts. In order to ensure proper installation of the 2 bolts, apply adhesive to the 2 bolts and install them within 10 minutes of adhesive application. (l) Install the 2 bolts. 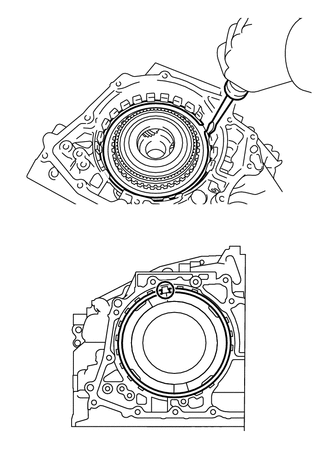 (m) Install a new gasket to the refill plug. 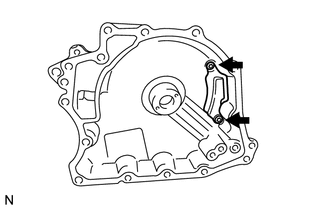 (n) Install the refill plug to the rear transaxle cover sub-assembly. (o) Coat 3 new O-rings with ATF and install them to the 3 No. 1 automatic transaxle case plugs. (p) Install the 3 No. 1 automatic transaxle case plugs to the rear transaxle cover sub-assembly. (a) Coat 2 new transaxle case gaskets with ATF and install them to the transaxle case sub-assembly. (b) Insert the pin of the manual valve lever shaft sub-assembly into the groove on the end of the manual valve and install the transmission valve body assembly to the transaxle case sub-assembly with the 11 bolts. 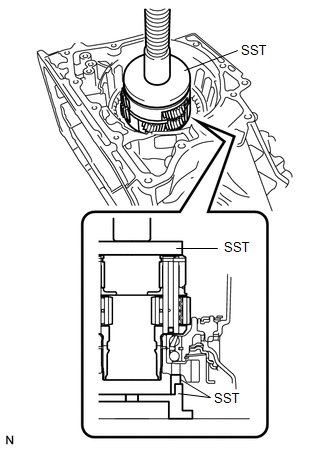 When installing the transmission valve body assembly, be careful not to allow the speed sensor and transaxle case sub-assembly to interfere with each other. 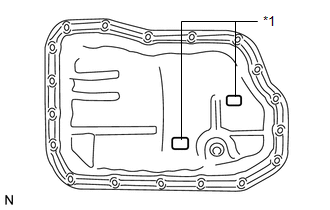 (b) Install a new automatic transaxle oil pan gasket to the automatic transaxle oil pan sub-assembly. 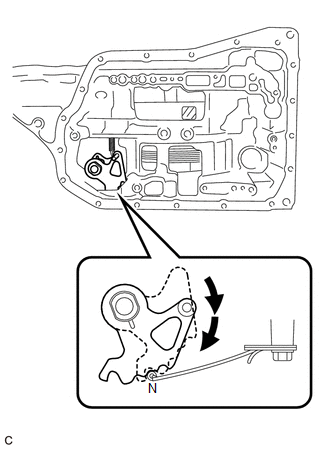 (c) Clean and degrease the bolt and installation hole in the automatic transaxle assembly. 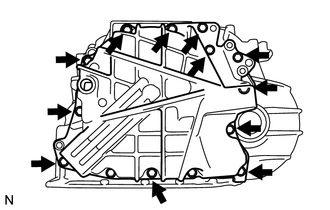 (d) Install the automatic transaxle oil pan sub-assembly with automatic transaxle oil pan gasket to the transaxle case with the 17 bolts. Completely remove any oil or grease from the contact surfaces of the transaxle case and automatic transaxle oil pan sub-assembly with automatic transaxle oil pan gasket before installation. 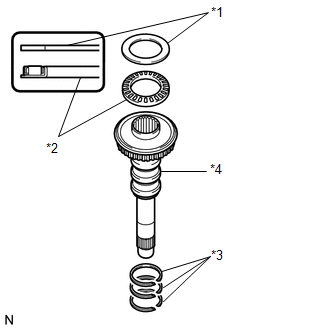 (e) Apply adhesive to 2 or 3 threads on the ends of the bolt. In order to ensure proper installation of the bolt, apply adhesive to the bolt and install it within 10 minutes of adhesive application. (g) Using a 6 mm hexagon socket wrench, install the No. 1 transmission oil filler tube to the automatic transaxle oil pan sub-assembly. (h) Using a 6 mm hexagon socket wrench, install the overflow plug and a new gasket to the automatic transaxle oil pan sub-assembly. (a) Install 3 new gaskets to the 3 No. 2 transaxle case plugs. (b) Apply adhesive to the 3 No. 2 transaxle case plugs. In order to ensure proper installation of the 3 No. 2 transaxle case plugs, apply adhesive to the 3 No. 2 transaxle case plugs and install them within 10 minutes of adhesive application. (c) Using a 6 mm hexagon socket wrench, install the 3 No. 2 transaxle case plugs to the transaxle housing. (a) Coat 3 new O-rings with ATF and install them to the 3 No. 1 transaxle case plugs. (b) Install the 3 No. 1 transaxle case plugs to the transaxle case sub-assembly. (a) Coat a new O-ring with ATF and install it to the oil cooler tube union (inlet oil cooler union). 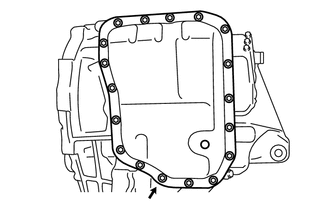 (b) Install the oil cooler tube union (inlet oil cooler union) to the transaxle case sub-assembly. (a) Coat a new O-ring with ATF and install it to the oil cooler tube union (outlet oil cooler union). 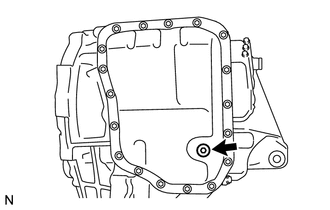 (b) Install the oil cooler tube union (outlet oil cooler union) to the transaxle case sub-assembly. (a) Align the protrusions of the park/neutral position switch assembly. 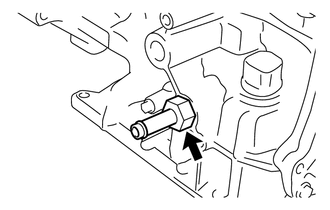 (b) Install the park/neutral position switch assembly to the transaxle case sub-assembly with the 2 bolts. 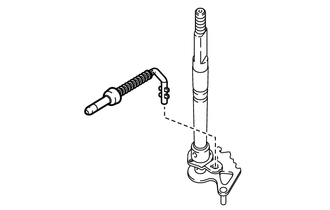 Before installing the park/neutral position switch assembly, remove any dirt or rust on the manual valve lever shaft sub-assembly. 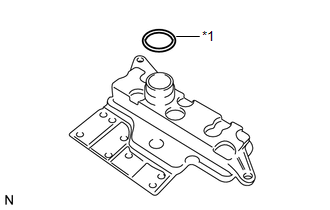 Be sure to install the park/neutral position switch assembly straight along the manual valve lever shaft sub-assembly while being careful not to deform the plate spring that supports the manual valve lever shaft sub-assembly. 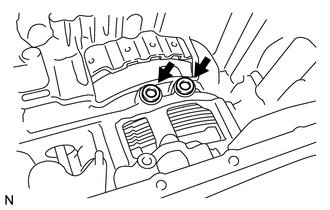 If the plate spring is deformed, the park/neutral position switch assembly cannot be reinstalled correctly. After installing the park/neutral position switch assembly, confirm that the 2 protrusions on the park/neutral position switch assembly are aligned. 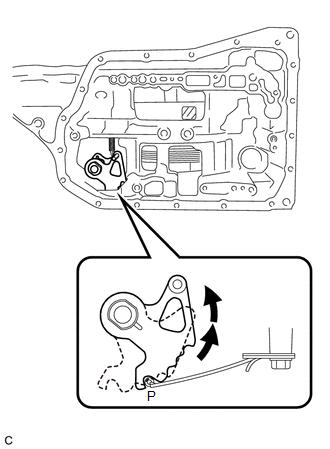 (c) Install the transmission control shaft lever to the manual valve lever shaft sub-assembly with the washer and nut. (a) Coat a new O-ring with ATF and install it to the No. 2 breather plug (ATM). (b) Install the No. 1 breather plug (ATM) and No. 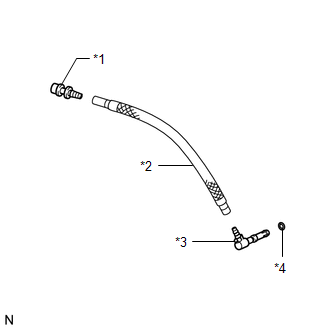 2 breather plug (ATM) to the breather plug hose. (c) Install the No. 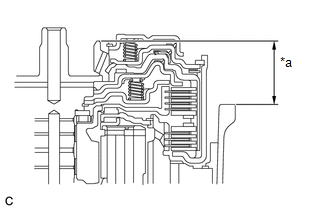 2 breather plug (ATM) to the transaxle case sub-assembly. Ensure that the stopper of the No. 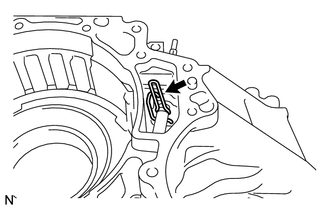 2 breather plug (ATM) is in contact with the side of the boss on the transaxle case sub-assembly.